Riyadh, Kingdom of Saudi Arabia, 15 August 2017: The third cycle of Huawei’s global CSR program for top Saudi students, ‘Seeds of the Future’, has recently culminated in the People’s Republic of China. Launched in collaboration with the Communications and Information Technology Commission (CITC), Huawei Tech Investment Saudi Arabia’s initiative aims to cultivate the Saudi ICT future leaders that will carry on the responsibility of the anticipated digital transformation, a key pillar of the Saudi vision. During the two-week educational trip, the students visited facilities throughout Beijing, and received extensive training courses at Huawei’s state-of-the-art laboratory in Shenzhen, where they learned about intelligent networks, cloud technology and the design behind some of Huawei’s most successful and innovative devices. 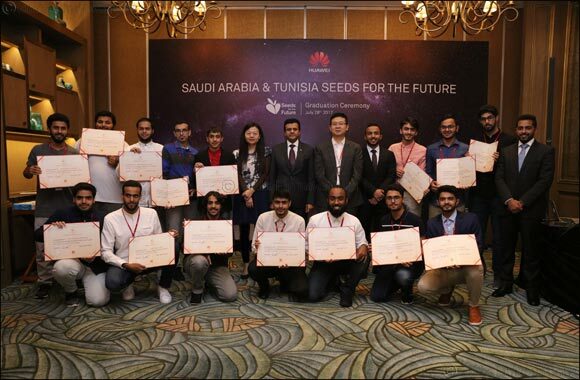 Dennis Zhang, CEO of Huawei Tech Investment Saudi Arabia, stated, “We are very happy to be completing yet another successful itineration of the Seeds for the Future program. It has been fantastic to continue our strong partnership with CITC in the Kingdom through the guidance and nurturing of some of Saudi Arabia’s finest young ICT minds. Moreover, we are pleased to be able to contribute to the goals set forth in the Kingdom’s Vision 2030. Advancements in the ICT industry and ICT education are integral to socioeconomic development of different countries. The program has acted as a crucial platform for sharing the latest ICT technologies and enriching students' work experience, helping to prepare them to work efficiently in ICT and mobile communications companies”. The returning students came from 17 universities across Saudi Arabia. As part of its commitment to the 2030 Vision, Huawei launched the ‘Seeds for the Future’ program in the Kingdom in 2015. The flagship global CSR program is aimed at cultivating local ICT talent, promoting knowledge transfer, improving people's interest in and understanding of the ICT industry, and encouraging countries and regions to participate in the building of digital communities. As an ICT leader, Huawei is committed to promoting the ICT industry development in the countries it operates, and aims to drive long term economic, social and environmental sustainability. The program represents Huawei desire to nurture the promising young professionals in every country the company operates. Over the course of the program Huawei shares its ICT expertise, and experience in managing a multinational with young ICT professionals, and help fuel the development of local ICT industries. By implementing the program in local markets, Huawei seeks to close the gap between knowledge learned in the classroom and the skills required by the industry today’s workspace. The initiative aims to develop ICT talent among Emirati students who will become tomorrow’s leaders of innovation.